Published: March 19, 2019 at 05:52 p.m. Updated: March 19, 2019 at 06:32 p.m.
Alabama has had 26 players selected in the first round since 2008 (start of the Nick Saban era), 10 more than any other school in that span. 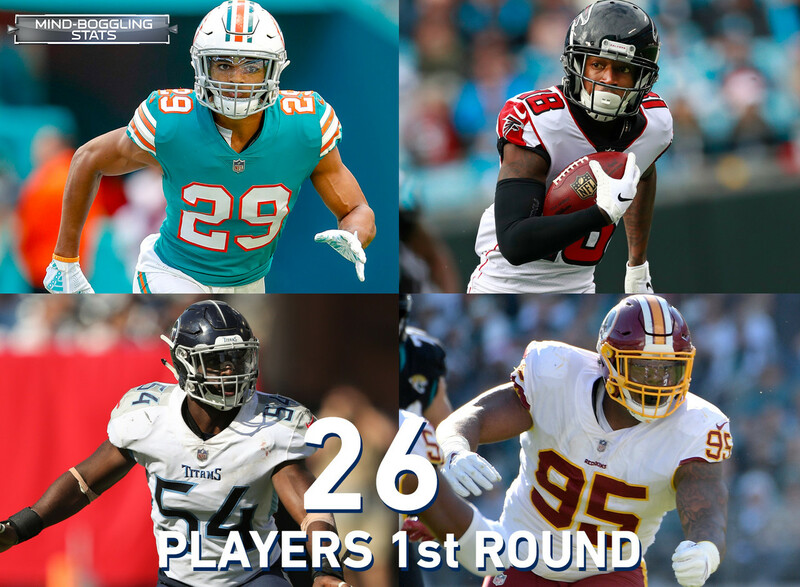 2018 had four first-round picks alone: Minkah Fitzpatrick, Miami Dolphins; Da'Ron Payne, Washington Redskins; Rashaan Evans, Tennessee Titans; and Calvin Ridley, Atlanta Falcons. Only three teams have not drafted a single player from Alabama in the Saban era -- the Carolina Panthers, Denver Broncos and Philadelphia Eagles. The Eagles have the NFL's longest "drought" without drafting a player from Alabama (last Alabama draft pick was receiver Freddie Milons in the fifth round in 2002). The Ravens have drafted seven Alabama players since 2008 (most by any team). Bradley Bozeman (center), Anthony Averett (cornerback), Tim Williams (linebacker), Marlon Humphrey (cornerback), C.J. Mosley (linebacker), Courtney Upshaw (linebacker) and Terrence Cody (defensive tackle) were former Alabama players taken by Baltimore. Seven teams have drafted two Alabama players in the first round since 2008 -- the Atlanta Falcons (Calvin Ridley, Julio Jones), Baltimore Ravens (C.J. Mosley, Marlon Humphrey), Cincinnati Bengals (Andre Smith, Dre Kirkpatrick), Oakland Raiders (Rolando McClain, Amari Cooper), Tampa Bay Buccaneers (Mark Barron, O.J. Howard), Tennessee Titans (Rashaan Evans, Chance Warmack) and Washington Redskins (Jonathan Allen, Da'Ron Payne).